CONNECTwww.com is proud to announce our second giveaway of 10 free AOMEI Partition Assistant Pro Edition licenses (Worth over US $36 x 10), thanks to AOMEI Technology. We will end the give away when we have enough participants. we will randomly pick 10 winners and send you the keys and product download link. 2.Leave a comment below with a link to your facebook username and Please mention why you need AOMEI Partition Assistant Pro Edition. (use a valid email address. We will use this address to notify the winner).That’s all!. 1. 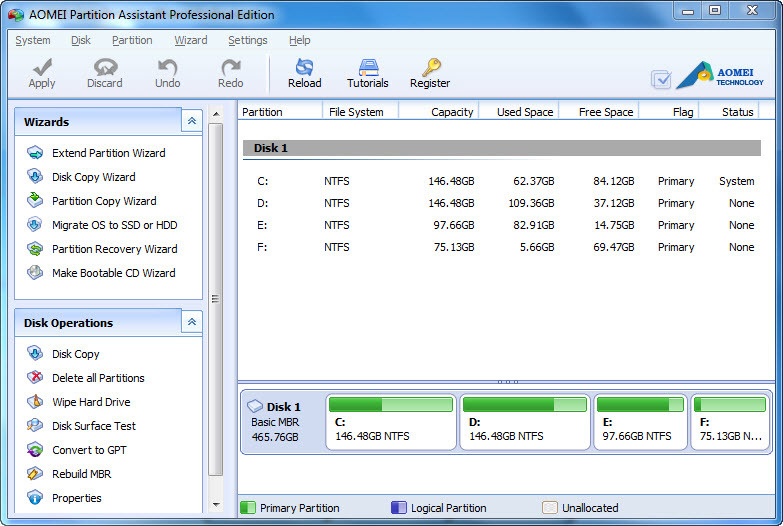 AOMEI Partition Assistant Pro Edition V5.1 is licensed per computer. 3. Transfer of a license to another owned computer is not allowed. 4. You can instal/register the software at any time. 5. Free email support is provided for the lifetime of the product. Hello, I was searching for a software that could convert a logical partition to a primary one in windows. Seems your software Aeomi Partition Assistant solves my issue. Perhaps, who doesnt need to manage their storage number of times. I’ve partitioned my PC thousands of time and it was just like Yukkk!! The whole organization is messed. I am willing for a fresh start with new Partition Table with the software. please Consider. Thank you!